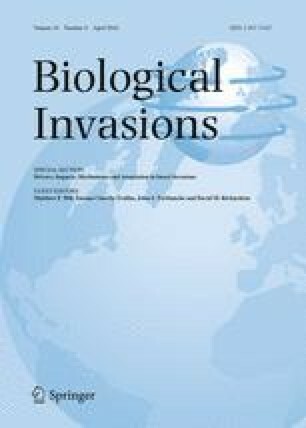 The paper had its origin at a workshop on “Drivers, impacts, mechanisms and adaptation in insect invasions” hosted by the DST-NRF Centre of Excellence for Invasion Biology in Stellenbosch, South Africa, in November 2014. Additional financial support was provided by HortGro, the National Research Foundation of South Africa, Stellenbosch University, and SubTrop. We are grateful to the members of the Tree Protection Co-operative Programme (TPCP), the National Research Foundation and the THRIP initiative of the Department of Trade and Industry (DTI), South Africa for providing funding that contributed to research underpinning arguments provided in this review. We thank Prof. Bernard Slippers for useful conversations that contributed to the completion of this paper. We also thank the three anonymous reviewers for their helpful comments and suggestions.